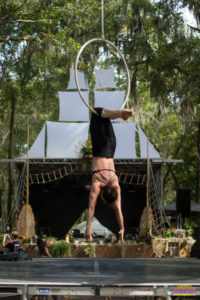 Suwannee Hulaween officially opened the festival gates to guests with three days passes. On Friday the festival hosted live entertainment featuring: Karl Denson, Gramatik, The String Cheese Incident, Future Rock and many more talented musicians. It marked my first time covering the event with Tony. My primary goal was to capture the event with photos and film, but with such an expansive festival, I wanted to help him out with the context and background on the live performances. Friday started off with relaxing yoga and physical fitness in the Spirit Lake area. As I grow older, I find myself needing to do more stretching when I wake up in the morning. After a night of camping, I found myself digging into the yoga culture at Hulaween 2016. The weather on Friday morning was refreshing with temperatures in the low ’70s. Tony and his crew were made up of good people from Jacksonville, Florida. There was also a solid group of people from where we grew up in Illinois as well. We all met up to watch an early set of music featuring the trio Joe Russo, Marco Benevento & Oteil Burbridge. Oteil Burbridge recently helped with bass during the Dead and Co. excursion. Joe Russo has also been honoring the music from the Grateful Dead with his own side project. It marked the first time I had seen Oteil perform with Joe Russo and Marco Benevento. Stream the show below. 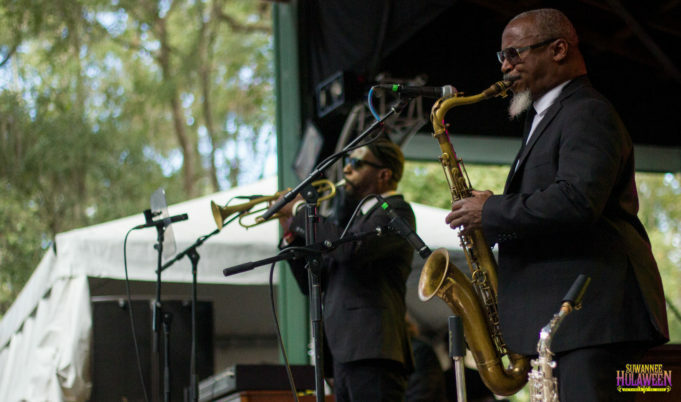 The saxophone legend known as Karl Denson performed live at Suwannee Hulaween with his backing band the Tiny Universe. This marked my second time seeing the band perform live following a 2002 set during late night at Bonnaroo. Hulaween reminded me a lot of Bonnaroo 2002-2004. The energy circling Karl Denson, The String Cheese Incident, My Morning Jacket, Antibalas and several more bands rekindles the indie passion that once made Bonnaroo the greatest festival on earth. Now with mainstream record companies owning a large stake in the creative control for booking at Bonnaroo; it opens the door for smaller events like Hulaween to build traction. 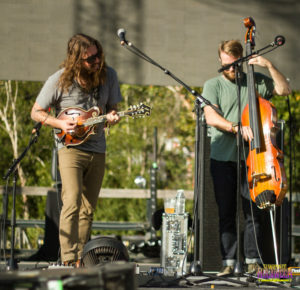 One of the bluegrass staples to Suwannee Hulaween is a group of musicians from Kalamazoo, Michigan known as Greensky Bluegrass. 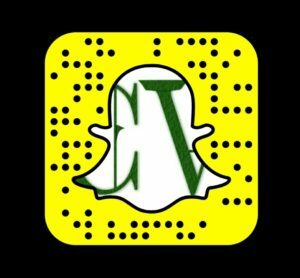 Tony was able to catch some of their late night set on Thursday. The band also performed a day set on the Meadow Stage. During their Friday set, Greensky Bluegrass busted out two big guest spots featuring Kyle Hollingsworth and Rosie Collier. Scan over and listen in to live performance from 10/28/16 at the Suwannee Music Park featuring Greensky Bluegrass on Mixcloud. After Greensky Bluegrass wrapped their set, Future Rock was pumping electronic rock on the Amphitheater Stage. 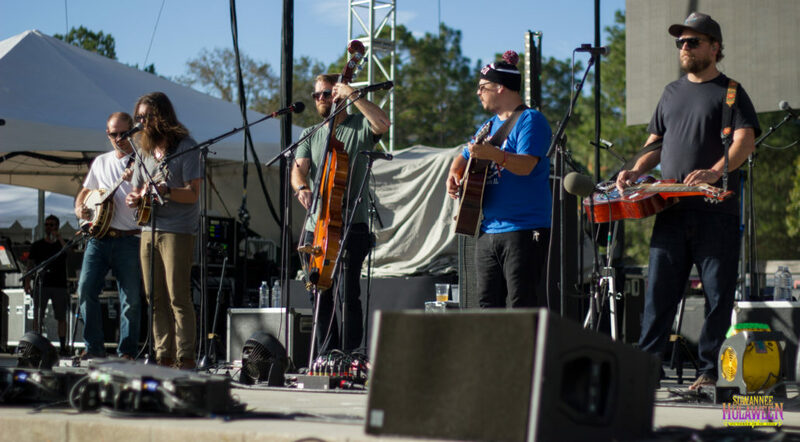 The Chicago-based band continues to perform above par at Suwannee Music Park. The Amphitheater Stage is surrounded with a canopy of southeastern trees. The Spanish Moss flows from one tree to another. Guests bring their hammocks to this area to enjoy live music and relaxation. The String Cheese Incident performed two sets of music on Friday evening. Stream them via Mixcloud. The music picked up with intensity as the sun flew over the Gulf Coast. The spirits within the Suwannee Music Park get wild during the night. In between the live music from String Cheese, I made my way to The Patch stage to check out Gramatik’s live set. The Patch was a new stage area in 2016. The location was easily found when walking from the Meadow Stage, but I got adventurous, and took the long way. It was a good thing I scheduled time to get lost, because I did find myself getting confused when walking down the main street at night. It would be great to see road signs clearly marked and lit up to give guests direction at night. Luckily, I started up a conversation with another guest that had a better sense of direction. Listen in to the two live sets from The String Cheese Incident from Friday, October 28. The Louisville-based group known as My Morning Jacket hit the stage in a mystic style. Jim James, lead singer and guitarist in the group, carried out a glowing glass skull to the stage. It reminded me a lot of the last Indiana Jones movie. Aside from crystal skulls, the band’s set was one of my favorite live shows that I have seen them perform. Their songwriting is a true sign of the depth within the band. Browse over photos and the setlist from the show. Southwest vibes rolled through the Amphitheater Stage late Friday evening with Anderson .Paak and the Free Nationals. It marked my first time seeing the band live. I took a short nap before heading to the Amphitheater stage. The band kicked off the set with house music featuring ‘Welcome to the Jungle.’ From the hand-selected house music, to the last beat of the live performance; Anderson .Paak and the Free Nationals stole the show for me. My pulse started to increase when I heard ‘Welcome to the Jungle,’ and I started walking faster. When the band kicked off their set with ‘Come Down’ I started running to the front of the stage. The rush of hearing one of the hottest tracks of 2016 live in such a perfect setting made for the opening of their set to be memorable and impactful. Browse over photos from their concert at Suwannee Music Park.